We just gave a try of the latest NiceHash Excavator 1.2.10 alpha miner (source) that includes new algorithms and some performance improvements. It has been a while since we have played with last, so there are some changes that we wanted to try out. 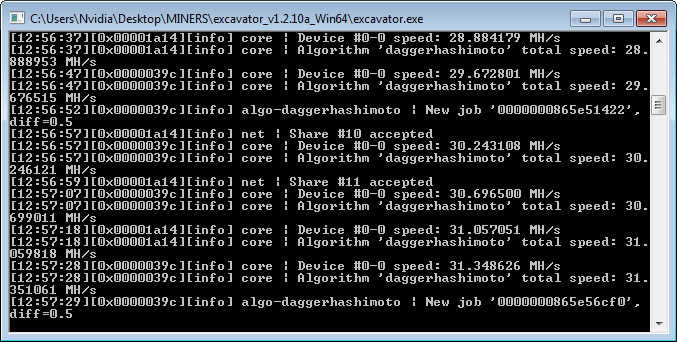 Excavator supports both AMD and Nvidia GPUs and works with some of the more popular mining algorithms, though performance wise it may not be the fastest on all of them. More notable is the performance improvement from the latest ethminer for Nvidia GTX 1060 and GTX 1070 GPUs that has also apparently been implemented in Excavator, so you might want to try that as well and see what results you are going to get if you are mining coins using the (Ethash) Dagger-Hashimoto algorithm such as Ethereum and others. Below you can find a 64-bit Windows binary that you can download and try will all of the supported algorithms, just modify the sample config files provided. Do note that Nvidia supports two more algorithms that have not yet been implemented on AMD GPUs!